Deep fried food....yum! Whoever first thought of it was a genius because there are a lot of foods that are so tasty when they've been given a dunk in a vat of hot oil and cooked to crispy goodness. I could go for a crunchy piece of deep fried chicken (or fish or fries or onion rings) right now! But you can keep the deep fried Snickers bars, Oreo cookies, and Twinkies. Those are some of the things that, in my opinion, should be kept far away from a vat of hot oil. But, no matter what you're cooking in a deep fryer we all know how messy it can be when done inside so why not give the camper or RVer on your list a portable deep fryer they can use outside. 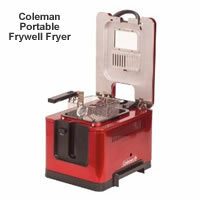 Coleman makes a portable table top fryer that uses a propane cylinder to heat it rather than a cord that needs an electrical outlet. It's cord free and completely portable! It has a 6 quart capacity, can cook at temperatures up to 450 degrees F, has built in carrying handles so it can be moved easily, has a striking high-gloss red metallic steel exterior that resists weather and corrosion, and if you purchase it from https://productspy.co.uk/deep-fat-fryer/, it comes with a 2 year warranty. 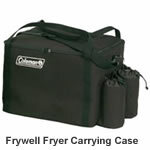 There's also a carrying case available to keep the fryer dust free and protected from scratches while not in use that also has 2 handy pouches for storing propane cylinders that is a great companion gift.